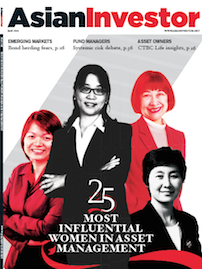 We reveal the 25 most influential women in asset management, explore talk of an impending EM crisis, debate whether fund houses are a source of systemic risk and examine China's sleeping hedge fund industry. We publish our 15th anniversary edition, split into two sections: one focusing on the development of asset management over the last 15 years, the other looking to its future. In the latest issue of AsianInvestor magazine, we interview the CIOs of Japan’s GPIF and Malaysia’s KWAP, analyse China’s onshore bond market and report from our Taiwan investment forum. We explore who pays for the lack of market-makers when the Fed raises rates, examine the risk appetite of Asia's largest asset owners, hear about demand for emerging market debt, and learn why private equity is under the spotlight. We outline the expansion of European family offices to Asia, hear from private bank fund selectors, consider calls for a technical turn to emerging market equities, explore Stock Connect issues and look into calls for clarity on OTC rules.